One of the most significant upgrades that you can make to your bike is a custom set of wheels. Most of the wheels that come standard on today's bicycles are fine, but they tend to be overbuilt in order to accommodate the wide range of riders that might use them. As a result you generally suffer a weight and performance penalty. I saw a need for custom wheels at an affordable price, so I started building wheels for my riding buddies (and myself.) After testing parts from several sources, I found a group of components which are now assembled in a package that offers maximum performance without sacrificing durability. Each wheel is built to tolerances that would cause most wheel builders to cringe (that is the what happens when you give an obsessive engineer a spoke wrench.) I believe the difference is evident with every revolution the wheel makes. Once you contact me, we will work together to determine the best wheel combination to meet your needs and stay within your budget. 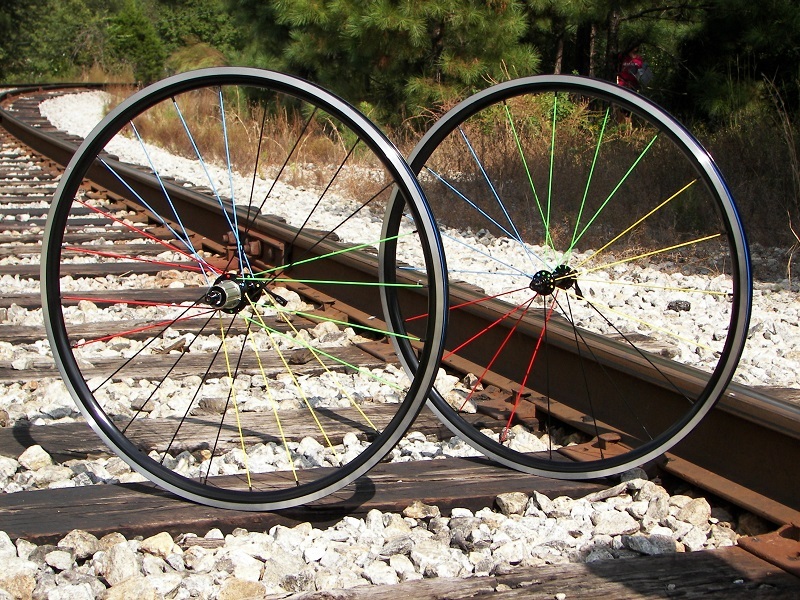 Every wheel is built to order so it is no problem to substitute parts, use custom colors, or change spoke counts. All this can be yours for a fraction of the price that the big brands charge. Thanks for looking and please don't hesitate to contact me if you have any questions.